Neptune's moon Triton was discovered by William Lassell. It is the seventh largest moon in the Solar system, and the only large moon with a retrograde orbit. J. C. Watson discovered asteroid #106 Dione. J. C. Watson discovered asteroid #139 Juewa. M. Wolf and A. Schwassmann discovered asteroid #450 Brigitta. P. Gotz discovered asteroid #546 Herodias. J. Palisa discovered asteroid #941 Murray; K. Reinmuth discovered asteroid #940 Kordula. K. Reinmuth discovered asteroid #961 Gunnie. K. Reinmuth discovered asteroid #1061 Paeonia. S. Belyavskij discovered asteroid #1984 Fedynskij. G. Neujmin discovered asteroid #1271 Isergina; K. Reinmuth discovered asteroids #1231 Auricula, #1232 Cortusa, #1233 Kobresia, #1272 Gefion, #2855 and #3144. A fire and explosion in his propellant processing room where black powder was compressed into solid rocket fuel caused burns fatal the next day to German rocket pioneer Reinhold Tiling, his assistant Angelika Buddenboehmer and his mechanic Friedrich Kuhr. A United Airlines Boeing 247 was destroyed by sabotage while en route from Cleveland, Ohio to Chicago, Illinois, the first such proven case in the history of commercial aviation. Goethe Link Observatory discovered asteroid #2300 Stebbins. USSR launched Marsnik 1 (Mars 1960A, Korabl 4) in an attempt to send a probe to Mars, but its booster failed to reach Earth orbit. Marsnik 1 (also known as Korabl 4 and Mars 1960A) was launched 10 October 1960, and reported by the NASA Administrator to Congress in 1962 to be an attempted Mars probe. Some Soviet scientists involved with the program at that time claim no knowledge of this mission, stating that only the launch on 14 October (Marsnik 2) was an intended Mars mission. However, V. G. Perminov, the leading designer of planetary spacecraft at the Lavochkin design bureau, states that this mission, identical to Marsnik 2, was indeed intended for Mars. Marsnik 1 would have been the Soviet Union's first attempt at a planetary probe. The mission objectives were to investigate interplanetary space between Earth and Mars, to study Mars and return surface images from a flyby trajectory, and to study the effects of extended spaceflight on onboard instruments and provide radio communications from long distances. Early reports indicated that after launch, the third stage pumps were unable to develop enough thrust to commence ignition, so Earth parking orbit was not achieved. Later information states that at T+300.9 seconds, the launcher went out of control and a destruct command was given at T+324.2 seconds, and that the engine of Stage 3 cut off after 13.32 seconds of burning. The possible cause lay in resonance vibrations of upper stages during Stage 2 burning, which led to a break of contact in the command potentiometer of the gyrohorizon. As a result, a pitch control malfunctioned and the launcher began to veer off the desired ascent profile. On exceeding 7 degrees of veering in pitch, the control system failed. The upper stage with the payload reached an altitude of 120 km before burning up on re-entry into the atmosphere above East Siberia. The spacecraft was nearly identical to the Venera 1 design, a cylindrical body about 2 meters high with two solar panel wings, a 2.33 meter high-gain net antenna, and a long antenna arm, and had a mass of about 650 kg. It carried a 10 kg science payload consisting of a magnetometer on a boom, a cosmic ray counter, a plasma-ion trap, a radiometer, a micrometeorite detector, and a spectroreflectometer to study the CH band as a possible indicator of life on Mars. These instruments were mounted on the outside of the spacecraft. A photo-television camera was held in a sealed module in the spacecraft and could take pictures through a viewport when a sensor indicated the Sun-illuminated Martian surface was in view. Attitude was to be controlled by a Sun-star sensor with attitude correction performed by a dimethylhydrazine/nitric acid binary propellant engine. The spacecraft orientation was to be maintained so that the solar panels faced the Sun throughout the flight. Power was provided by the two-square meter solar panels which charged silver-zinc batteries. Radio communications were made using a decimeter band transmitter via the high gain antenna for spacecraft commands and telemetry. Radio bearing was used to maintain the antenna's orientation to Earth. Images were to be transferred using an 8-cm wavelength transmitter through the high-gain antenna. A fourth stage was added to the booster (Molniya or 8K78) for the interplanetary mission, the new launcher was designated SL-6/A-2-e.
NASA launched Explorer 22 (Beacon Explorer-B, BE-B) from Vandenberg, California, on a Scout rocket, to collect ionospheric and geodetic data. 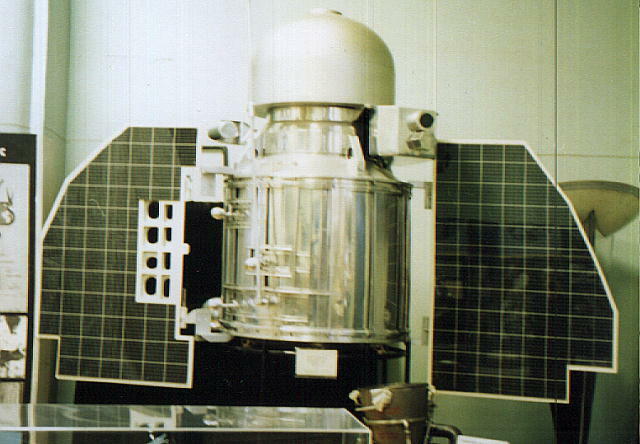 BE-B (Beacon Explorer-B, Explorer 22), launched 10 October 1964, was a small ionospheric research satellite instrumented with an electrostatic probe, a 20-, 40-, and 41-Hz radio beacon, a passive laser tracking reflector, and a Doppler navigation experiment. Its objective was to obtain worldwide observations of total electron content between the spacecraft and the Earth. It was initially spin-stabilized, but it was despun after solar paddle erection. Subsequent stabilization oriented the satellite axis of symmetry with the local magnetic field by means of a strong bar magnet and damping rods. A three-axis magnetometer and sun sensors provided information on the satellite attitude and spin rate. There was no tape recorder aboard, so satellite performance data and electrostatic probe data could be observed only when the satellite was within range of a ground telemetry station. Continuous transmitters also operated at 162 and 324 MHz to permit precise tracking by "Transit" tracking stations for navigation and geodetic studies. In August 1968, data acquisition from the satellite telemetry channels was discontinued. In July 1969, tracking and world map production were discontinued by GSFC, and world map production based on NORAD orbit elements was subsequently assumed by ESRO. The satellite failed in February 1970 and BE-C (65-032A) was turned on in order to partially replace use made of this satellite's beacon experiment. The United Nations Outer Space Treaty went into effect to govern its signatory nations. Felix Aguilar Observatory discovered asteroids #2284 San Juan and #2311 El Leoncito. The Westar 2 communications satellite was launched from Cape Canaveral, Florida, positioned in geosynchronous orbit over the Americas at 123 deg W 1974-1982; 79 deg W 1982-1986. Purple Mountain Observatory discovered asteroid #3187. The Ocean Dynamics Satellite (Seasat 1), launched 27 June 1978, was designed to provide measurements of sea surface winds, sea surface temperatures, wave heights, internal waves, atmospheric liquid water content, sea ice features, ocean features, ocean topography, and the marine geoid, the first satellite designed for remote sensing of the Earth's oceans with synthetic aperture radar (SAR). Seasat 1 provided 95% global coverage every 36 hours. The instrument payload consisted of (1) an X-band compressed pulse radar altimeter (ALT), (2) a coherent synthetic aperture radar (SAR), (3) a Seasat-A scatterometer system (SASS), (4) a scanning multichannel microwave radiometer (SMMR), and (5) a visible and infrared radiometer (VIRR). The accuracies obtained were distance between the spacecraft and the ocean surface to 10 cm, wind speeds to 2 m/s, and surface temperatures to 1 deg C. On 10 October 1978, Seasat 1 failed due to a massive short circuit in its electrical system. During most of its 105 functional days in orbit, Seasat 1 returned a unique and extensive set of observations of the Earth's oceans. For more information about Seasat 1, see "Seasat mission overview," Science, v. 204, pp. 1405-1424, 1979, and a special issue on the Seasat 1 sensors, IEEE J. of Oceanic Eng., v. OE-5, 1980. Purple Mountain Observatory discovered asteroid #2510 Shandong. Alison McNay discovered asteroid #3764 Holmesacourt at the Perth Observatory in Bickley, Western Australia; C. Shoemaker discovered asteroid #3299 Hall. The Very Large Array (VLA) radio telescope network was dedicated. USSR's Venera 15 orbiter arrived at Venus. The Soviet Union fired a "warning shot" from the Terra-3 laser complex at Sary Shagan, tracking Challenger with a low power laser that caused malfunctions in on-board equipment and discomfort of the crew, leading to a US diplomatic protest. 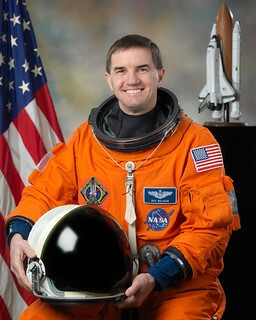 D. Waldron discovered asteroid #3753. NASA's STS 41 (Discovery 11, Shuttle 36) landed after carrying the Ulysses solar polar probe and the Shuttle Solar Backscatter Ultraviolet (SSBUV) and INTELSAT Solar Array Coupon (ISAC) experiments to orbit. USSR's Soyuz TM-12 landed with the crew of Artsebarsky, Aubakirov and Viehboeck aboard, returning from the Mir space station. On the second successful Zenit-3SL flight from the Odyssey launch platform in the Pacific Ocean near Kiritimati (the first with a commercial payload), the DirectTV 1-R communications satellite was positioned in geosynchronous orbit at 81 deg W.
During the 7h 1m STS-112-1 EVA, after exiting from the ISS Quest module, Atlantis astronauts Wolf and Sellers connected fluid lines and installed equipment on the S1 truss installed onto the ISS five hours earlier by the station's Canadarm2.